Lauren Bernadett is a natural resources lawyer who has counseled private and public clients through administrative processes and litigation in state and federal courts. 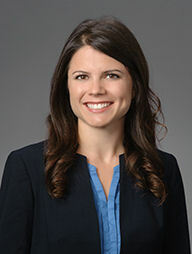 Lauren advises clients on compliance with various laws, and values clear communication and problem solving during litigation and in efforts to avoid litigation. Lauren’s substantive experience is diverse, covering many aspects of water law, environmental law, public law, administrative law, and contract law. Lauren earned her J.D. from the UCLA School of Law, where she was the Joyce A. Will Scholar in Environmental Law and served as a Managing Editor for the UCLA Law Review. After law school, Lauren moved to Arkansas to pursue an LL.M. in agricultural and food law at the University of Arkansas School of Law in Fayetteville. During her LL.M. program, Lauren focused on agriculture and water law, wrote and published several law review articles, and co-authored a chapter for the American Bar Association’s book on urban agriculture. Lauren’s talent for taking initiative and promise in the environmental law field secured her scholarships that fully funded her J.D. and LL.M. education. Lauren has a particular interest in aquaculture regulation and compliance. She serves as the legal advisor for the California Aquaculture Association and has advised clients on the several legal hurdles aquaculturalists face at the local, state, and federal levels. Lauren has given presentations on aquaculture regulation at several industry meetings and conferences, and planned the first California Aquaculture Law Symposium at UCLA. Outside of work, Lauren can be found with friends on the soccer field, at the climbing gym, training for her next race, or enjoying Sacramento’s food scene. She is mother to a pack of rescue dogs who match her enthusiasm for morning jogs and exploring northern California’s great outdoors.